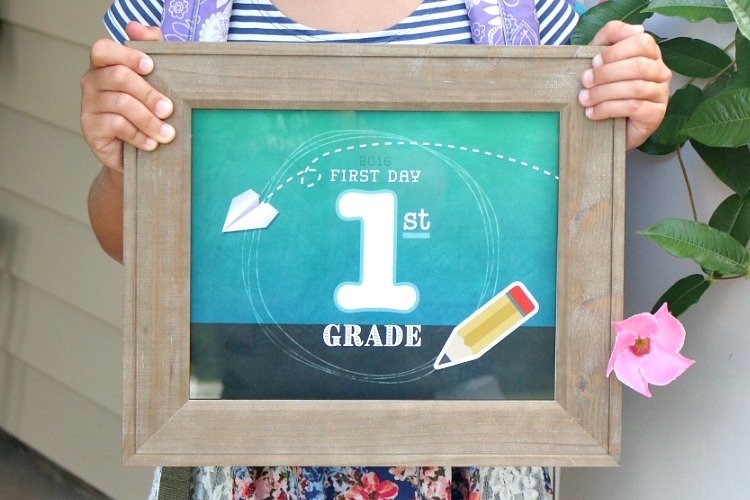 Capture your child’s first day of school with these adorable free printable signs! 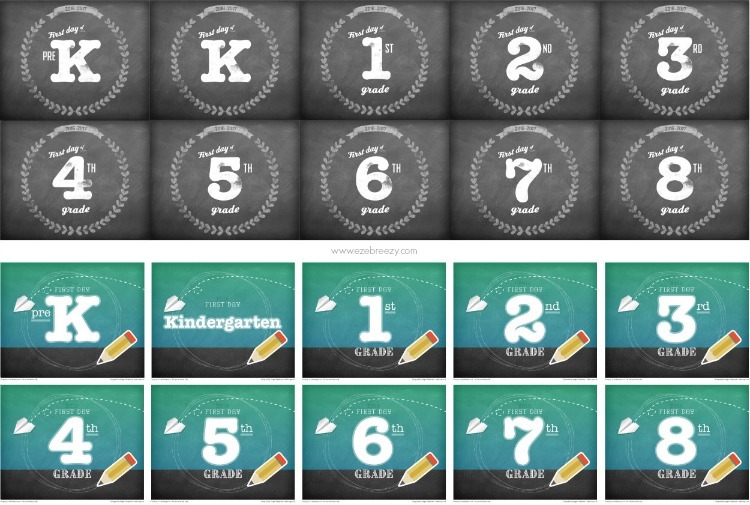 These printables are available in two different adorable designs for Pre-K through Eighth Grade. *Be sure to stop by and check out these cute Apple First Day of School signs HERE. 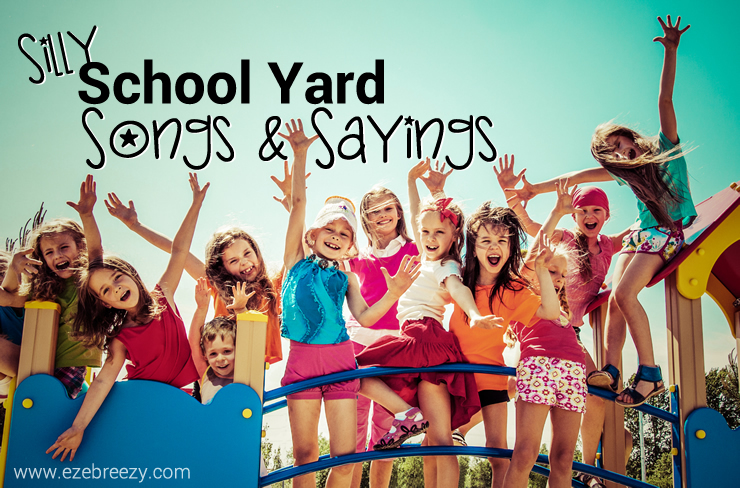 I can’t believe I am saying this…it’s almost SCHOOL TIME! I am not sure where this summer has gone. I know we’ve been crazy busy but it all seems like a blur. We’ve gone on vacation, knocked out some crafts, and even had some mommy-daughter time making homemade ice cream sandwiches. 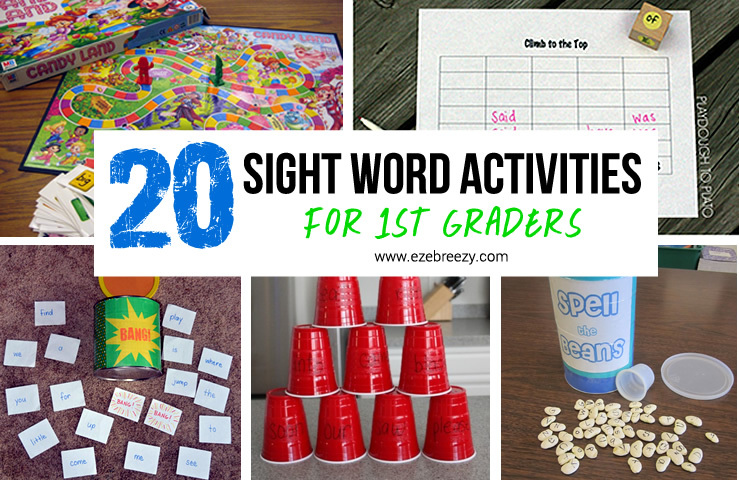 But now that we are headed toward the end of our summer, and it’s time to get into back-to-school mode. I have so many exciting back-to-school ideas that I’ll be sharing with you over the next few weeks, and this free printable of First Day Of School Signs are the perfect way to get things started. My very dear friend Megan is a graphic artist. She is super talented and I am beyond excited that she put together this free printable for you all. 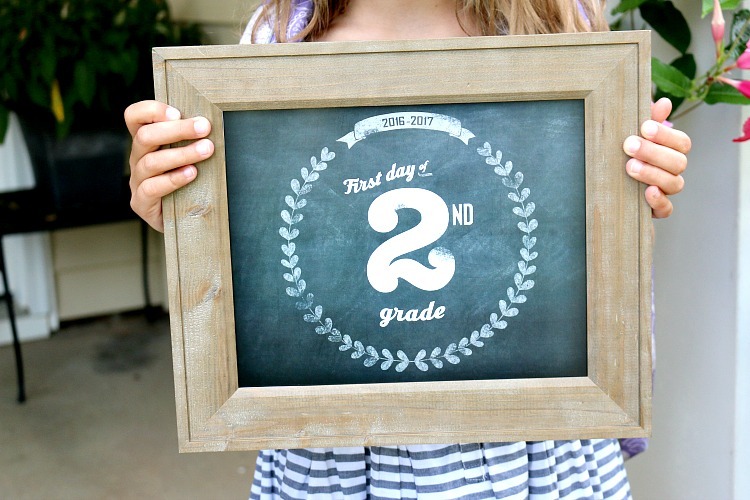 These adorable First Day of School Signs are the perfect way to mark the start of the new school year for each of your kids. 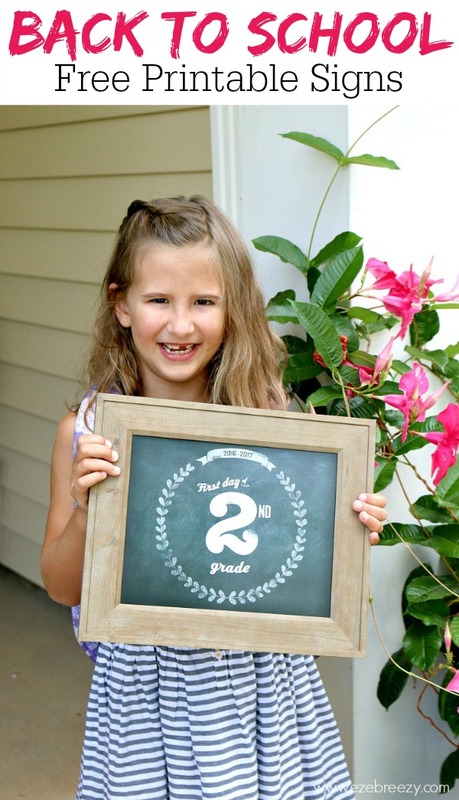 And if you missed it, earlier this summer, Megan created this free printable for your first day of school pictures…see it HERE. Megan was so smart and made this free printable 8″x10″, so any picture frame will work perfectly. I happened to have this frame at home but you can find some really cute ones at Walmart for around $3-$4, and I’ve even seen some at the Dollar Store that would work. Here’s a little tip: take out the glass from the picture frame. This will eliminate any potential glare when you take your picture and it’s much safer for the little ones to hold. So take your pick! You can find each free printable just click on one of these links below. Have a GREAT first day back to school and don’t forget – stop over HERE and check out this cute Apple First Day Back to School Sign free printable! I love these! 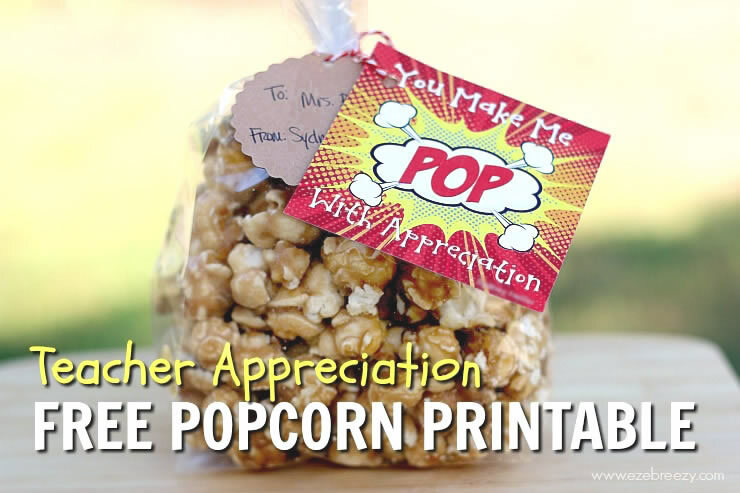 Is there any chance you might make some for this back to school year? Tank you! And yes…working on more for this upcoming school year so be sure to check back on ezeBreezy.com in August:) Thanks again.